It’s not the profound reminiscence one might wish for at, say, one’s funeral or anything, but it’s nice to be remembered for something. And when you’re an editor, the something quite likely involves a comma. I used to begin emails exactly as Ann remembered. It bugged me when people wrote “Hi so-and-so comma” as a salutation. Not one part of that structure is grammatically sound: the interjection “hi” needs a comma after it, and because the whole statement is a sentence, it needs a period at the end, not a comma. 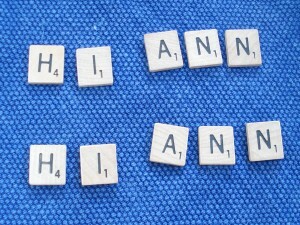 When an email starts with an adjective plus the person’s name, things are different. Then the comma is correct afterwards. Time went on and my email salutation started looking . . . frankly, a little odd. Editors and writers, even teachers of editors and writers, increasingly wrote “Hi Frances,” at the head of their emails. Gradually, I began to feel uncertain, then — much worse — pompous. Whenever I wrote “Hi comma So-and-So period,” it was like showing up in Armani when everyone else was in Old Navy. Ann, it’s great to hear from you! I was wondering, Ann, if . . .
How to punctuate an email salutation is a nicety that only grammar geeks would fret over. But fret we do. At least some of us. What about you? Previous post from Frances Peck: Introverted Networking: Not an Oxymoron. 20 Responses to "Perilous Punctuation: The Email Salutation"
Thank you, Frances, for this post. I persist in the use of the comma and period in email salutations. I use this style with everyone. It’s a matter of demonstrating to non-editors the correct grammar, but it’s also part of a larger effort to make communication, especially email communication in a business setting, as precise as possible. I consider the precision that language offers to be one of its great joys. Always nice to see a post from you, Frances. I haven’t been using a greeting in email messages for several years now. I just plunge right in. I think that is related to office memo style – the “To” line replaces the greeting. Interesting, Anita. I’d like to hear what Frances has to say about this approach! I do the “plunge right in” thing after the first email or two in an exchange. Often by then the correspondence has changed into a Q&A, comment-style exchange. But for the initial email, I do like a salutation to pave the way. I’ve known about this for quite some time, but I just find Hi, Frances. looks so pedantic, so I don’t use it. I feel most of the people I write to either don’t know or don’t care or they think the comma and period look weird or even wrong. But why not dispense with the greeting/salutation completely? In the age of text messaging, it seems extraneous and unnecessary. Perhaps this is an example of the standards for one form of greeting [Dear Frances] being applied to the one that is replacing it [Hi Virginia]. It’s a variation on the back-formation of words. I like this shift in greetings, from Dear to Hi, which allows us to use formal or informal approaches, even with strangers. And I especially like that it’s possible for us to reform our old rules to suit new forms. I knew this topic would stir everyone up! It’s another illustration of that narrow ridge we editors walk between correctness and naturalness. Take “we editors” in the sentence you just read, for instance. Correct, sure. Natural-sounding? Not so much. Thanks for the comments so far. I’m eager to see how other careful editors are handling the salutation. I suppose similar questions and dilemmas arise for the closing. Just seeing “Thanks.” (or another word such as ‘regards’ or ‘cheers’ followed by a period) can seem abrupt and not really all that thankful. “Thanks!” can appear forced, but sometimes is appropriate. Writing “Thanks, myname.” on one line doesn’t work because it looks like you are thanking yourself. But “Thanks, myname” is common and looks fine despite the dubious use of the comma. Not including a closing at all can seem hurried or even rude. Thankfully (? ), with texting and instant messaging a simple “thx” is often enough! with the comma (of course) and no space between the two lines because that’s how you’d sign off a letter—assuming you’re not leaving space for a handwritten signature. In my experience, most people do use the comma with their sign-off, which is as it should be. But many insert a line space between the “thanks” and their name, and I’m not sure why. Am I off base with the spacing? What do others think? As I said about the greeting, a closing is not needed either. Most emails I send and receive are like texts, with the content and nothing else. Rosemary, you’ve raised an excellent point about how much time we should devote to the correctness of our own emails. In West Coast Editorial Associates, we have an agreement that when we email one another, we don’t proofread. Typos are overlooked; no judgments are made. I feel different, though, when emailing a client or a student. They’ll surely forgive the occasional typo (they’d better! ), but if there are too many lapses, I fear they’ll lose confidence in my ability to edit or instruct. My email volume is about the same as yours, and some days it feels as if emails are the point of my work, not the medium for getting it done. If the English world could agree to a standard salutation and closing (or two), as in the old days of letters, it would save a little time and decision-making through the day. This comma is vanishing from direct address all over the place. “Hi Frances” is the sibling of “Come on guys” and “Go Raptors!” Whether people drop it because of the haste of texting or tweeting or because of ignorance, I’m not sure, though I suspect most people used it in the early days of email and gradually dropped it as they noticed others doing so. I still use it in emails, but I’m not bothered when others don’t. I’m certainly bothered, though, when I see it missing in print, which is just about every day when I open my newspaper. It’s hard to eat breakfast when I’m gritting my teeth. It might be considered rude, but to me it’s just efficient – getting to the point with no extraneous verbiage. My boss at my new job who is an English major and grammar nazi publicly berated me during a group meeting this week about my salutations. She said that my use of period after her name made her feel like I was yelling at her or asserting dominance. I interchange between “Hello, Name.” and “Hello, Name,”. It never made a difference to me. A co-worker in the meeting also agreed with my boss. I think this was an odd criticism. While I will be more mindful when I email her, I think it doesn’t really matter. Such a small thing to berate someone about. Most people don’t use salutations in email.